Torino achieved their second consecutive victory after Rolando Bianchi's first half header gave the Granata all three points in a difficult away fixture against Portogruaro. Bianchi was restored to the starting line up, at the expense of Biagio Pagano and that proved to be the right decision as he headed home Luciano Zavagno's cross to give Toro the lead. Torino restricted their hosts to half chances, and could have extended their lead as both Alessandro Pellicori and Dejan Lazarevic forced good saves from the home goalkeeper. Bianchi was substituted in the second half due to a slight calf injury, but is expected to be fit for Wednesday's home game against Atalanta. Despite this victory, Torino still find themselves outside the playoff positions because all of their immediate rivals also won, but it is only goal difference that separates them from the top six. Torino will be looking to capitalise on their impressive performance against Pescara last weekend as they aim for a second consecutive victory away at Portogruaro, knowing that a win would really consolidate their playoff ambitions. Franco Lerda will have a tough decision to make before kick off, as he will have to consider whether to start captain and top goalscorer Rolando Bianchi on the bench as he did last Saturday. Portogruaro are currently enjoying their first spell in Italy's second division, however it may be a short lived stay in Serie B, as they currently find themselves in the lower echelons of the table, and their priority for the remainder of this season will be to ensure they avoid relegation. 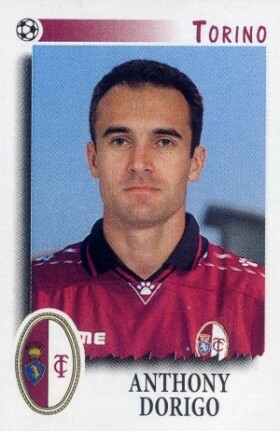 Thanks to the wonders of Twitter, this blog has been able to conduct its first interview with a former Torino player, ex England International Tony Dorigo, who played for the club in the 1997-98 season. Enjoy! Hi Tony, you are currently working in the media side of football at the moment, Have you ever been tempted to become a manager? Not when I retired, that was the last thing on my mind. But the more media work I do, the idea of getting back in the game sounds an option. So, how did a Melbourne born England International end up signing for Torino? I always wanted to play in Italy as I thought it would suit my style. There was talk of me going to Bari (from Aston Villa) at the same time as David Platt and that would have been a good age to go. Unfortunately that didn't work out and I thought I had missed the chance until Graeme Souness became the Torino manager. He tried to sign me several times for Glasgow Rangers from Chelsea, this time it did work out and I got my Italian experience albeit late in my career. Were you weary about moving to Italy, and especially leaving the Premier League to play in the Italian second division, Serie B? Yes and no. I had a few injuries which meant I lost my England place and at 31/32 years old I thought I could have a few years in Italy to finish, get Torino to Serie A, and then a couple more years and that would have been a nice way to end. Did you know much about Torino's distinguished history before signing or were you made aware of it whilst you were at the club? A little as my father is Italian, although I didn't realise how much of a powerhouse they were in the era of supplying 10 of the 11 players for the national team. What are your memories of the Torino fans, and their rivalry with Juventus ?, Do you wish you could have played in a derby match? They were great, the atmosphere was wonderful even though the Delle Alpi didn't lend itself to the greatest of atmospheres. They live and breathe the club and I would have loved to have played in a derby. As one of the few successful English players to ply their trade in Italy, Do you think it would be beneficial for more English players to experience playing abroad? Definitely, it is a wonderful experience and you come into contact with more styles/players that can only add to your game. I am glad you said successful because I am very proud that I was voted player of the for the only season I was there! I also won this award at Villa, Chelsea, Leeds (Championship winning year) and Torino - these are all fans awards and so mean that much more! Unfortunately I'm going to have to ask about the missed penalty in the Playoff Final against Perugia, how did your team mates and the fans react to you afterwards? Did their reaction help you get over it? Whilst perhaps not comparable with winning the league title with Leeds, or playing in the 1990 World Cup with England, what did winning Torino's player of the season award in your first season mean to you ? Ah, answered a bit of this above - a great and cherished honour and a wonderful memento of a short Italian experience. Sadly, you left Torino after playing just one season, I understand it was due to the financial constraints at the club that led to you leaving, did you have any options to stay in Italy before joining Derby? I was very disappointed, it came about as I was ready to board the plane for pre season training with Torino. Yes, there was an Italian option but unfortunately I had to go through a legal process first which meant I couldn't sign for anyone for a month or two. Then Derby came in for me and all the family were already based back in England, so I signed a 2 year deal back to the Premiership. Although it is now more difficult to follow Torino's fortunes since they were relegated to Serie B, do you try and look out for their results, and do you keep in touch with any of your old team mates ? I do look out for their results and it still seems difficult to be a Torino fan! I kept in touch a little with Massimo Ficcadenti (my room mate) and it's great to see him at Cesena, I really hope he keeps Cesena up. Also (Edy) Reja is doing great at Lazio but the language is now mostly forgotten so not so easy to communicate. When Massimo called it was like listening to a machine gun ! I would like to once again thank Tony for taking the time out to answer these questions, and you can follow Tony on Twitter Here. Torino ended their poor run of form with a 3-1 home victory over Pescara, but had to come from behind to do so. Before the game started the biggest talking point centred on coach Franco Lerda's decision to leave captain and top goalscorer Rolando Bianchi on the bench, and when Souleymane Diamoutene headed home after 12 minutes, Torino fans feared the worst. However, the home side fought back gallantly, and equalised through Daniele De Vezze's header from Biagio Pagano's fine cross. Torino took the lead minutes into the second half, after Angelo Ogbonna's brilliant long pass found Mirco Antenucci who stabbed home, to score his first goal for the club. Rolando Bianchi came off the bench midway through the second half, and almost predictably, it was he who scored the third goal. The ex Manchester City striker had a simple tap in after a great cross from Dejan Lazarevic, who was a constant threat throughout the whole game. Bianchi celebrated passionately by the Torino bench, perhaps illustrating that he was not happy with the coach's decision to start him on the bench, though ultimately that decision was vindicated. Torino had to survive a late onslaught from Pescara, when Gianluca Nicco hit the crossbar, and the away team were awarded a penalty following Claudio Rivalta's handball, but Rubinho produced a fine save from Marco Sansovini's penalty, to keep the score at 3-1. This victory has moved Torino up to 7th position, and are only kept out of the playoff positions by goal difference, and the impressive nature of the performance, combined with the favourable result, should ensure Franco Lerda's position at the club is secure for the time being. It will be interesting to see whether Lerda will continue to keep Bianchi on the substitutes bench in future weeks, or whether he can find a way to fit both Antenucci and Bianchi in the same starting eleven. Tuttosport have described Saturday's home fixture against Pescara as a 'Day of Judgement' and for once, it is difficult to disagree with the Turin based newspaper. Torino coach Franco Lerda heads into the game with question marks surrounding his future at the club after two consecutive defeats, and a third, would almost certainly signal the end of his tenure. Whilst Torino desperately need a victory, the challenge to beat Pescara will be a difficult one. The team from Abruzzo currently lie one place above Torino in the Serie B table, and will believe that a victory over the seven times Scudetto winners, would enhance their own chances of reaching the playoffs. Rolando Bianchi celebrates his 28th birthday today, and whilst Torino are not enjoying their best form on the pitch at the moment, this seems to be a perfect excuse to relive some happier moments, and what is better than watching some of Rolando's best goals in a Torino shirt. Sometimes football can be a cruel game, and it proved to be once again as Torino fell to a 1-0 defeat to Novara after Agostino Garofalo's freak own goal. Torino started the game brightly, obviously eager to make amends for last weeks home defeat against Sassuolo. However, midway through the first half, Novara took the lead totally against the run of play, in bizarre circumstances. Novara striker Cristian Bertani gathered the ball on the left hand side of Torino’s penalty area and fired a shot that was parried by Rubinho, however the ball ricocheted off the heels of left back Agostino Garofalo and, despite the goalkeepers best efforts it crawled into their net. On reflection, Rubinho should perhaps have prevented the goal, but it was surely the last thing he expected after making the initial save. Torino could have went further behind, if it wasn’t for the Brazilian shot stopper who made two fantastic saves in quick succession, first from close range after it seemed certain Simone Motta would make it 2-0, then minutes later when he tipped Bertani’s shot over the bar. Torino started the second half brightly, and Mirco Antenucci was unlucky when his volley hit the post, while Rolando Bianchi had a valid claim for a penalty turned down. Torino’s performance in the second half probably justified a point, but when Antenucci hit the bar in injury time, it was evident that it wasn’t going to be their day. Torino's promotion hopes were dealt a huge blow after an embarrassing home defeat against relegation threatened Sassuolo. The defeat was disappointing for the home side, due to the fact Torino had taken the lead in the first half, with Rolando Bianchi (who else) converting a penalty after Angelo Rea was penalised for a handball in the area. However, Torino were unable to capitalise on the lead given to them by their captain, and Sassuolo equalised ten minutes into the second period, via Andrea De Falco's outstanding free kick. De Falco then scored what proved to be the winner mid way through the second half, after Sassuolo were awarded a penalty when Valerio Di Cesare was harshly adjudged to have fouled Andrea Catellani. Whilst this defeat was undeniably a painful one for the fans to endure, the reality is that Torino are only out of the playoff positions on goal difference, and promotion, albeit via the playoffs is still possible. However, questions must be asked as to why Torino continue to underachieve despite having one of the best squads in the division. In Angelo Ogbonna and Rolando Bianchi, they have two players who have been the subject of interest from many Serie A teams, and the fact they have been able to retain these players should have acted as a catalyst for a promotion push. Instead the team seems to have gone backwards since the winter break, and have not won a league match since December 18th. After the final whistle on Saturday, a lot of the fans anger was directed towards chairman Urbano Cairo, and perhaps a change in ownership would be one way to move the club forward. The future of coach Franco Lerda could also be questioned, though for a club who have had seven coaches in five years, stability is certainly something that has been lacking, and wouldn't be helped by another change in that department. Torino continue on their quest for a first Serie B victory of 2011 with a home game against Sassuolo, the team they beat in the playoff semi-finals last season. Whilst that campaign ultimately ended in failure, with defeat to Brescia in the final, it looks increasingly likely that Torino’s best chance of promotion this season will also be via the playoffs. Although Torino currently occupy the last playoff position, their form has been unimpressive since the beginning of the New Year, and that will have to improve if they want to be serious promotion contenders. Their opponents Sassuolo have not been able to repeat the success they enjoyed last season, and currently find themselves embroiled in a relegation battle. Therefore,Torino can expect a difficult game, against a team also desperate for points. Antenucci, Bassi, Bianchi, Budel, Cavanda, D'Ambrosio, De Feudis, De Vezze, Di Cesare, Garofalo, Gasbarroni, Lazarevic, Obodo, Ogbonna, Pagano, Pellicori, Rivalta, Rubinho, Sgrigna, Zavagno. As the first post on this blog, I decided to attempt to make some predictions of which players Torino would be looking at purchasing in the January transfer window, as well as the suggestion that it would be unlikely that Toro would be able to keep Angelo Ogbonna. Fortunately for all Torino fans, Toro were able to maintain the services of the highly rated defender, unfortunately for this blog however, out of the three players suggested as possible transfer targets, a grand total of zero came to fruition. Whilst Filippo Carobbio, Abdelkader Ghezzal, Cristian Pellerano did not sign, Torino were busy in the window, with Alessandro Budel, Denilson Gabionetta and Biagio Pagano all being signed to strengthen the midfield. Perhaps the most important signing however, may be the purchase of striker Mirco Antenucci who may be able to relieve some of the pressures placed on the shoulders of Rolando Bianchi, who yet again has been the main goalscorer this season. Torino were also busy on deadline day, with the loan signing of Lazio full back Luis Pedro Cavanda, whilst Portuguese defender Filipe Oliveira has returned to Parma, after his loan spell was terminate by the club. Oliveira was not the only departure of the window, with Isaac Cofie and Luigi Scaglia returning to their parent clubs after loan spells. Luca Belingheri left the club to join Livorno, and Massimo Loviso has joined Crotone on loan. Whilst Mario Salgado, Aimo Diana and Jurgen Säumel all had their contracts terminated by mutual consent.